#bellwether is a data collection project that examines the language surrounding american electoral politics. specifically, the project examines social media data collected during the primary campaigns for the 2016 presidential election, and asks whether or not we can use it in order to extract a more nuanced or accurate read on the political desires of the voting population of ohio, a state that is regarded as vital to the endgame of both parties, but whose citizens are often treated as faceless, nameless votes. between august 6, 2015, and july 12, 2016, using a small computer program i wrote, i attempted to collect every tweet possible that mentioned any of 22 presidential candidates from the two major american political parties by name. the collection process started with the initial debates, and ran up until just before the nomination conventions. i then filtered down the data collected to focus solely on tweets that are from or are concerned with ohio specifically. after the tweets were filtered, i ran a variety of algorithmic language analyses on the content of the postings to determine a number of things: sentiment, frequency of similar or identical posts and phrases, grammatical structure, and the like. i most commonly used something called "regular expressions", which are text-matching patterns that look for specific words or phrases within the data. i used the results to doctor the campaign merchandise of the presidential candidates; instead of reflecting the candidates' curated messages, they represent how the candidates themselves are perceived by ohio residents. while the objects created are not meant to mirror the data in their physical form (meaning their size or design), the number and types of objects per candidate per month entirely depend on how much and what content i extracted from the total tweets. the design language — color, typography, imagery and logos — mirrors that of the official campaigns as closely as possible. 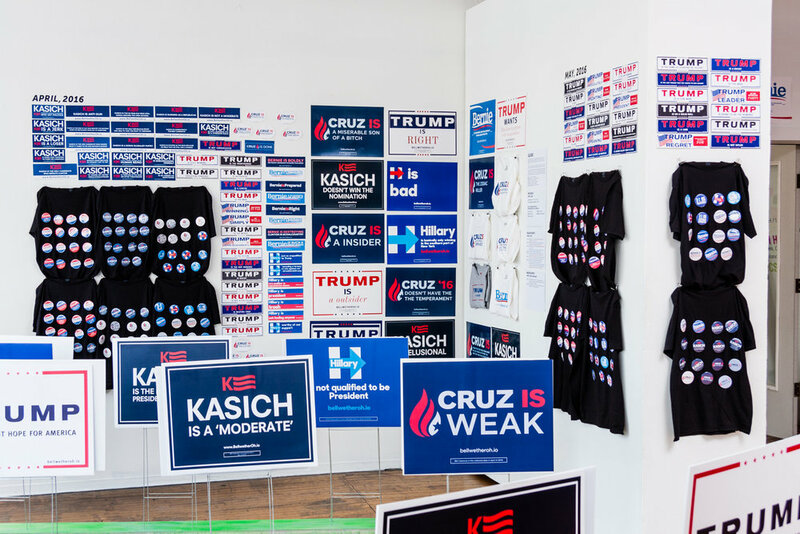 the objects are exhibited in a monthly timeline, displaying how perceptions of each presidential candidate shift and change over the course of primary season — just like the content, positions, and tones presented by the campaigns themselves. 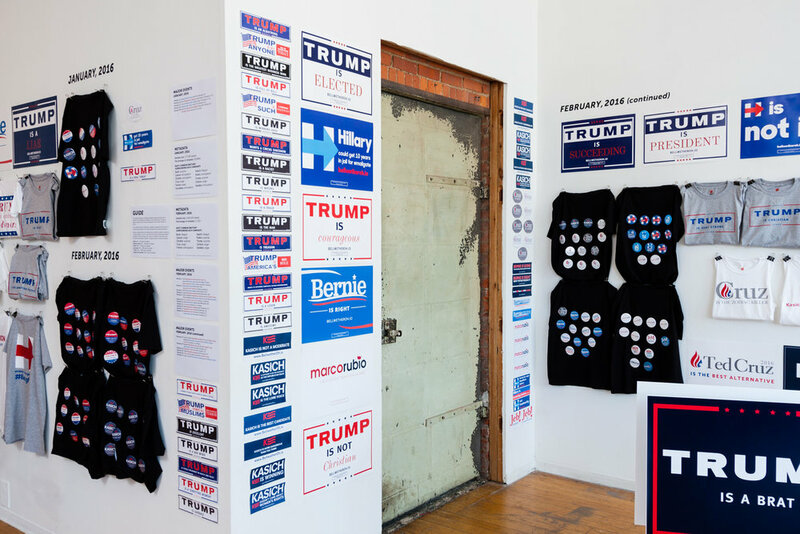 "#bellwether" was commissioned by SPACES (cleveland, OH), as part of the SWAP (SPACES world artists program) residency, may 20 - july 29, 2016.
listen to a recording of "the american dream: a symposium at the intersection of art and politics", city club cleveland podcast. recorded 19 july, 2016.